Refresh a Web page; refresh the Folder List; when in Split view, refreshes Code view changes in Design view. Switch between open Web pages. Switch between open Web pages in reverse order. Preview a Web page in a Web browser. Display HTML tags in Design view. Find text or HTML on a Web page. Find the next occurrence of the most recent search. Find the previous occurrence of the most recent search. Find the next occurrence of the current selection. Find the previous occurrence of the current selection. Replace text or HTML on a Web page. Check spelling on a Web page. Look up a word in the thesaurus. Move through open dialog boxes. Move through open dialog boxes in reverse order. Delete a Web page or folder in the Folder List or any dialog box. Preview the current page in a Web browser. Rename the currently selected file in the Folder List. In the More Colors dialog box, activate the color picker. Note SHIFT + TAB should activate, in order: Cancel, OK, Select, Custom, Value, and then the color picker. Cut selected text to the Microsoft Office Clipboard. Go to the end of a word. Go to the beginning of a word. Go to the end of a line. Go to the beginning of a line. Go to the end of a paragraph. Go to the beginning of a paragraph. Display the properties of a selection. Select the next table cell's content. Select the preceding table cell's content. (press one of the arrows repeatedly) With the insertion point in a cell, extend a selection to adjacent cells in a row. down shift and press UP or DOWN ARROW repeatedly With the insertion point in the top or bottom cell of a column, select a column. With the graphic selected, create an auto thumbnail (thumbnail: A miniature representation of a picture on a Web page, usually containing a hyperlink to a full-size version of the graphic. Thumbnails are used to load pages rich in graphics or pictures more quickly in a Web browser.). Create a hyperlink (hyperlink: Colored and underlined text or a graphic that you click to go to a file, a location in a file, a Web page on the World Wide Web, or a Web page on an intranet. Hyperlinks can also go to newsgroups and to Gopher, Telnet, and FTP sites.) on a Web page. Display the Help task pane. Switch between the Help task pane and the active application. Select the next item in the Help task pane. Select the previous item in the Help task pane. In a Table of Contents, select the previous and next item, respectively. In a table of contents, collapse and expand the selected item, respectively. Open the menu of pane options. Close and reopen the current task pane. Select the next hidden text or hyperlink, or Show All or Hide All at the top of a topic. Select the previous hidden text or hyperlink, or the Browser View button at the top of a Microsoft Office Online Web site article. Scroll small amounts up and down, respectively, within the currently displayed Help topic. AND PAGE DOWN Scroll larger amounts up and down, respectively, within the currently displayed Help topic. Change whether the Help window appears connected to (tiled) or separate from (untiled) the active application. Display a menu of commands for the Help window; requires that the Help window have active focus (click an item in the Help window). Move to a task pane (task pane: A window within an Office application that provides commonly used commands. Its location and small size allow you to use these commands while still working on your files.) from another pane in the program window (clockwise direction). You may need to press F6 more than once. Note If pressing F6 doesn't display the task pane you want, try pressing ALT to place focus on the menu bar, and then pressing CTRL+TAB to move to the task pane. Select the menu bar (menu bar: The horizontal bar below the title bar that contains the names of menus. A menu bar can be the built-in menu bar or a custom menu bar. ), or close an open menu and submenu at the same time. When a toolbar (toolbar: A bar with buttons and options that you use to carry out commands. To display a toolbar, press ALT and then SHFT+F10.) is selected, select the next or previous button or menu on the toolbar. When a toolbar is selected, select the next or previous toolbar. Open the selected menu, or perform the action for the selected button or command. Display the shortcut menu (shortcut menu: A menu that shows a list of commands relevant to a particular item. To display a shortcut menu, right-click an item or press SHIFT+F10.) for the selected item. Display the window shortcut menu (Control menu). Select the menu to the left or right. When a submenu is open, switch between the main menu and the submenu. Close an open menu. When a submenu is open, close only the submenu. When a menu is selected, display the list of commands. When a personalized menu is open, display the full set of commands. Move to a task pane (task pane: A window within an Office application that provides commonly used commands. Its location and small size allow you to use these commands while still working on your files.) from another pane in the program window. (You may need to press F6 more than once.) Note If pressing F6 doesn't display the task pane you want, try pressing ALT to place focus on the menu bar, and then pressing CTRL+TAB to move to the task pane. Open or close a task pane. Open a drop-down menu for the selected task pane. Move among choices in a selected submenu; move among certain options in a group of options. Open a shortcut menu (shortcut menu: A menu that shows a list of commands relevant to a particular item. To display a shortcut menu, right-click an item or press SHFT+F10. ); open a drop-down menu for the selected gallery item. When a menu or submenu is visible, select the first or last command on the menu or submenu. Go to the previous folder . Up One Level button: Open the folder one level above the open folder. Display a shortcut menu (shortcut menu: A menu that shows a list of commands relevant to a particular item. To display a shortcut menu, right-click an item or press SHFT+F10.) for a selected item such as a folder or file. Perform the action assigned to the selected button; check or clear the selected check box. First letter of an option: in a drop-down list: Open the list if it is closed and move to that option in the list. (press underlined letter while holding Alt) Select an option; select or clear a check box. Perform the action for the selected item in a smart tag menu. Display, edit, or run macros. Display the Microsoft Script Editor. Display the Microsoft Visual Basic Editor. 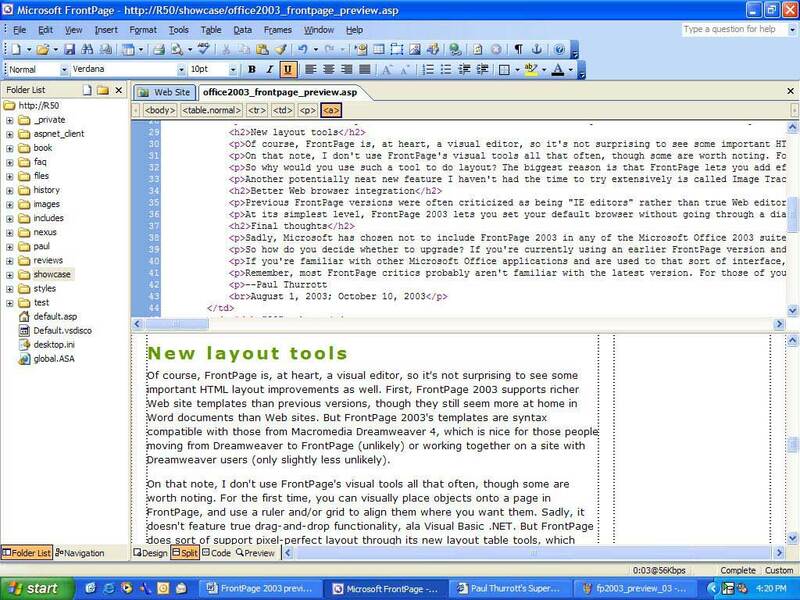 Microsoft FrontPage is a discontinued WYSIWYG HTML editor developed by Microsoft. It was part of the Microsoft Office from 1997 to 2003. FrontPage is replaced by Microsoft Expression Web and SharePoint Designer but these two programs are also discontinued in favor of web-based SharePoint Designer. What is your favorite Microsoft FrontPage hotkey? Do you have any useful tips for program? Let other users know below.